This patented technology is based on a catalytic transformation process capable of breaking down material containing molecules of carbon or hydrogen, and later restructuring them to produce high quality fuels, such as petrol, diesel, kerosene or naphtha. This process is rapid, ecological and profitable. The initial project was to develop an effective refining process for the world’s heaviest oils, like the Maya and Ku crude oils. Now the system has developed beyond its original concepts, and is capable of producing high quality oils from other waste material, and with the possibility to chose the end product; gasoline, kerosene, naphtha etc. •	The production process produces a minimal amount of contaminating gases. 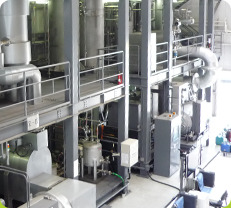 •	The system can process crudes such as Maya or Ku, that are often resistant to traditional refining methods. •	The combustion of our product produces significantly lower emissions of contaminating gases, responsible for the global “green house” effect. •	The end product is desulphurized and oxygenated, thus it requires fewer additives.